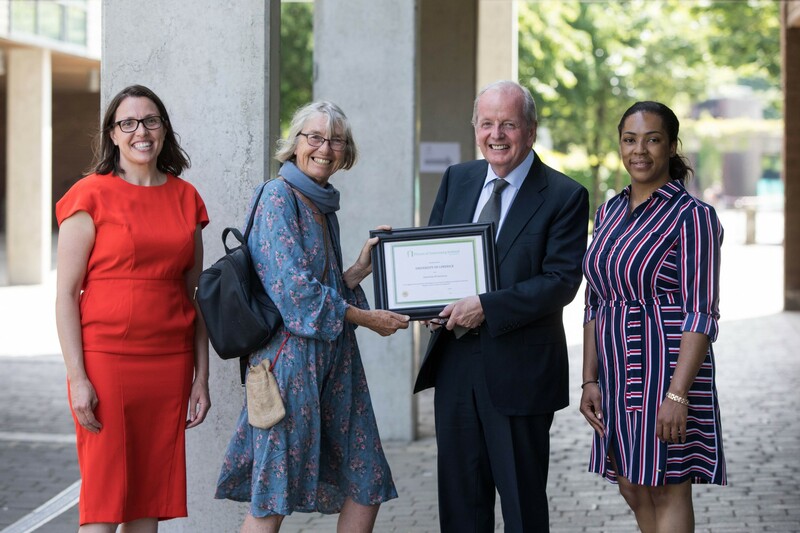 Dr Mairead Moriarty, Chair of the University of Limerick's Sanctuary steering committee, Tiffy Allen, Network Coordinator for City of Sanctuary Ireland, Professor Des Fitzgerald, President, University of Limerick and Donnah Vuma, Zimbabwe pictured attending a ceremony at University of Limerick where the University of Sanctuary award was officially presented to UL. Today, United Nations World Refugee Day (20/06/18), University of Limerick (UL) announced that it will offer 15 new four-year undergraduate scholarships to refugees and asylum seekers beginning in September. This is in addition to 15 one-year Mature Student Access Certificate (MSAC) scholarships, which were first introduced last year for people living in Direct Provision. Furthermore, funding has been committed for an additional cohort in the 2019/2020 academic year, bringing the total number of Sanctuary Scholarships at UL to 60 over the next two years. Today’s announcement comes after UL was awarded University of Sanctuary status on World Refugee Day 2017 and announced the introduction of its Sanctuary Scholarships programme. “UL is very proud of its University of Sanctuary status and is committed to continually broadening access to higher education across the entire population. We hope to enable as many students as possible who have the potential to go to university to make it there, in this case by removing insurmountable financial barriers,” said Vice President for Academic Affairs and Student Engagement at University of Limerick, Professor Kerstin Mey. UL’s largest programmes, Bachelor of Arts (BA) and Bachelor of Business Studies (BBS). “Of course, we are delighted to be in a position to offer scholarships to mature students again this year on the MSAC one-year programme. However, it is really exciting to extend UL’s programme of scholarships for refugees and asylum seekers and offer young people, who are attending secondary school, the opportunity to carry on their studies at university with the security of knowing they have the support for the four-years of their undergraduate programme,” said Dr Máiréad Moriarty, Chair of the University of Limerick's Sanctuary steering committee. “Without a scholarship, many young refugees and those young people seeking asylum and living in Direct Provision would not have the means to pay international fees to attend university in Ireland. UL is providing 10 fee waivers for mature applicants and five for Leaving Cert applicants to two of its most popular programmes. The BA and BBS offer our widest range of module choices and offer work placement opportunities as part of the CoOperative education programme here providing graduates with a wide range of skills and career opportunities,” Dr Moriarty continued. The undergraduate Sanctuary Scholarships waive international fees for four years while the MSAC Sanctuary Scholarships comprise a fee waiver and a contribution towards travel, on-campus subsistence, stationery, printing and IT requirements. “While UL is waiving the academic fees for its new undergraduate Sanctuary Scholarships, the university is keen to extend these to cover subsistence. With that in mind we’d love to hear from companies who would be interested in supporting these students, many of whom have overcome the most challenging and traumatic of circumstances, through their Corporate Social Responsibility divisions,” Dr Moriarty stated. Alongside the Sanctuary Scholarships, UL offers a wide range of undergraduate scholarships and non-traditional access routes to third-level education for Leaving Cert and mature students and students attending the university. UL offers academic scholarships, sports scholarships, women in science, technology, engineering and mathematics scholarships and the President’s Access Scholarships, amongst others. • Be unable to access mainstream funding, e.g. student finance or a local authority grant (Those who are classed as ‘care leavers’ and previously were under local authority care can also apply). The Mature Student Access Certificate (MSAC) is a one-year full-time pre-degree course designed for mature students who wish to develop or refresh key learning skills, and to undertake some foundation level academic studies, before applying directly for a degree programme. The MSAC certificates are valid for three years, which means that holders can use them to enter undergraduate courses in the university any year, over the next three years.